With his career stalled and the office abuzz about his soon-to-be-ex-wife’s indiscretions, Ottawa bureaucrat Charlie Hillier is desperate for a change. So when the chance at a posting to the Canadian Embassy in Havana comes up, he jumps at it, grateful to get as far away as he can from his ex and his dead-end job at Foreign Affairs headquarters. 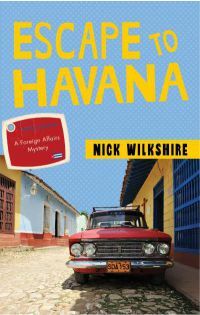 At first, Havana seems just the place to bury his past and start anew, but he didn’t count on finding a couple kilos of cocaine under his bedroom floor, the kidnapping of a fellow diplomat, or the unsettling connection he uncovers between the former occupant of his house and a Colombian drug-runner. Before long, Charlie’s only concern is whether he’ll survive his posting at all.